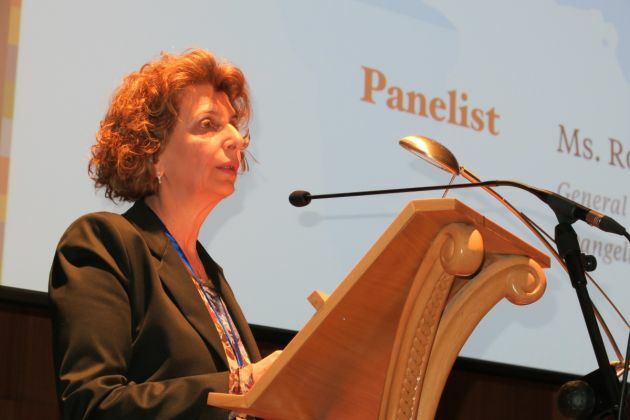 (Photo: © Peter Kenny / Ecumenical News)Rosangela Jarjour, General Secretary of the Middle East Evangelical Churches on No. 2, 2015 a meeting on "Discrimination, Persecution, Martyrdom: Following Christ Together - Voices from Suffering Churches" organized by the Global Christian Forum in Tirana, Albania. TIRANA, Albania - When the people of the Middle East despair for their faith's future in their region, they might reflect on the testimony of the Catholic Archbishop of Shkodër, Angelo Massafra, who has explained how Christianity rose up again in once atheist Albania. Massafra was speaking about 4 November 1990 at a time when religion had been banned for decades by the communist dictatorship in Albania and people seeking to flee the country could be killed. His witness was part of the first day of the Global Christian Forum's consultation - "Discrimination, Persecution, Martyrdom: Following Christ Together - Voices from Suffering Churches" at a panel discussion. He recounted that a priest, Simon Jubani, who'd just been released from prison himself, decided to say a Mass at a time that Christians commemorate their saints and those who have departed during the tyranny of one of the communist era's most repressive States'. He decided to defy the communist authorities' brutal oppression and on 4 November 1990 said the Mass at a chapel in a cemetery which had been spared from destruction. When there were no repercussions from the authorities, he further defied orders not to hold another mass on 11 November. Massafra's message of hope and recovery was followed by testimony from Christians in besieged areas of the Middle East. Rosangela Jarjour, General Secretary of the Middle East Evangelical Churches, told how extremism triggered by the Syrian civil war is leading to Christians being singled out and forced to flee. "From the Christian quarters of al Hamidiya and Bustan el Diwan in the old city of Homs, the city where I spent my childhood and teenage years, more than 80,000 Christians were cleansed from their homes in early 2012, and their homes were occupied by the militant rebels (al Farouq brigades). "The 100th Armenian genocide was commemorated in Aleppo with the Islamic factions' leveling to the ground of seven buildings in Al-Suleimania Christian neighborhood on Good Friday (April 10, 2015). 29 Christians lost their lives and 56 were injured. Easter Sunday was the day to mourn the dead family members and relatives as the whole town was in deep shock. "Only three weeks before that, 179 Christian families lost shelter and all possessions after the al Nusra Front stormed the city of Idlib. Of these families, only 85% of Christians were able to flee, with women wearing Islamic robes and hijabs; the others faced an unknown fate," she said. She explained that daily mortar and missile attacks by the so-called moderate rebels on Meharda and the Christian neighborhoods of Damascus and Aleppo have claimed hundreds of innocent civilians' lives - among them children in attacks on schools and nurseries. The Christian population of 400,000 in Aleppo, many of Armenian descent, had already been reduced to an estimated 45,000 by March 2015. From neighbouring Iraq came a similar message where the number of Christians has severely dwindled by more than half in recent times to around 400,000. Bishop Basel Yaldo, Auxiliary Bishop of the Chaldean Catholic Patriarchate of Babylon noted Iraq has some of the world's oldest settled Christian communities, which have been there since the first century. Neither the international community nor the Iraqi government is doing enough to stop the massacre and cleansing of Christians being carried out by the extremists, the auxiliary bishop said. "All Iraqi people are suffering from the current situation, but the most oppressed are Christians," he said. Yaldo noted this is because they are a minority in the country, and Christians have no power or authority in the State. The Global Christian Forum is a movement of representatives from diverse Christian churches, organizations and traditions meeting on an equal basis, to foster mutual respect and to address common challenges together. It includes, Catholics, Evangelicals, Orthodox Christians, Pentecostals, and tradional Protestants.